Enfamil Family Beginnings program offers free gifts for expectant parents. If you register for free at enfamil.com, or at many doctors offices across the country, new parents will receive a diaper bag with samples, a feeding kit, and a free portrait offer from JCPenney. Parents can also receive up to $60 in formula rebate checks. Not to be outdone, in May rival formula-maker Similac relaunched its Welcome Addition Club as Strong Moms to connect mothers online. In addition to advice, the Web site provides month-by-month guides on pregnancy and baby development, as well as many free samples of its product. 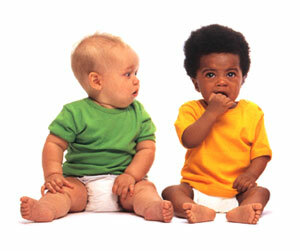 Gerber has a Growing Up Gerber program that also provides free samples and coupons for parents. The Web site has a store locator, and offers parenting tips, too. Child photo site TheCuteKid.com offers your child exposure to talent and casting agents for free. (Agents are only allowed to contact parents through the email network on the Web site.) In August, the Web site will give away thousands of dollars worth of prizes with a Mommy & Me photo contest that will be chosen by the site's 1.2 million member's popular vote. You can enter on the site. Recently, a set of twins were cast for a Brawny's paper towel print and commercial campaign, says Greg Byrnes, a site co-founder. If Looking Who's Talking Too is not an option for potty training, there's always Huggies free interactive DVD. The offer is good while supplies last and you must register online to receive the DVD in 4 to 6 weeks. Also, Pampers Let's Talk Potty program provides certificates so your child can feel like a star when they are done potty training. Several baby magazines offer parents-to-be and new parents free subscriptions. American Baby gets to most every new mom for free. Babytalk Magazine also offers free subscriptions. If you're looking for information on storing your baby's umbilicial cord, ViaCord and Cord Blood Registry offer free kits for new parents. Looking for more Web sites to get your started on the road to freebies? Check out BabytoBee and Babycenter.com. Both are wealth of information...and freebies, for moms-to-be. What are your favorite freebie sites for new moms? We'd love to hear your suggestions!